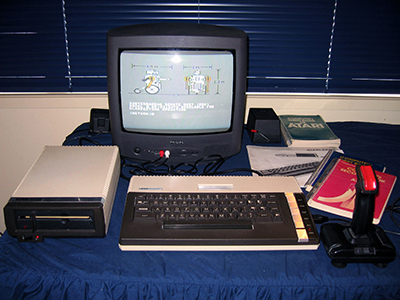 Video Game-maker Atari spawned a range of computers of which the Atari 800XL was one of the most popular. Driven by the ubiquitous 6502, gaming credentials are to the fore in this machine, with graphic sprites, great sound and a handy 64K RAM. Released in 1983, it weathered the home computer wars and although beaten up somewhat by the Commodore 64 in the sales stakes, it still managed to post a respectable score. I'd never used an Atari until I acquired one around 2008. I like it! I like it more than the C-64. The model is light, compact and nice looking, the keyboard has good positive feel, the video is crisp and loading a game from disk is easy and fast. Most are self-booting. I've had several Atari 800XLs since my first. That first one (seen opposite) was OK on the outside but in bad shape internally! Years of sleeping under a bed in a (damp?) bedroom saw a touch of rust in the chassis along with (more seriously) a completely non-functioning keyboard! Thankfully, disassembly and cleaning remedied the problem but it took a bit of work. I then acquired another one with a yellowed case but clean-looking internals. It needed fixing and de-yellowing but once that was done I had a nice looking unit both inside and out. Finally I was given a third Atari 800XL which was naturally non-yellowed, clean internally and working. This one is now my showcase model. The rest have been set aside for spare parts. I've got a stack of manuals, books and disk software with it and produced more disks from images on the Internet. However I've also obtained an SIO2SD disk drive emulator so I can use that if I don't want to drag the drive out. I'm well-stocked with Atari 800XL goodies then.